During the Damage Step, in either player's turn, when a face-up EARTH Normal Monster you control attacks or is attacked: You can send this card from your hand to the Graveyard; that monster gains 1000.. If this card is sent to the Graveyard for a Synchro Summon: You can Special Summon this card. You must have 3 or more "Laval" monsters with different names in your Graveyard to activate and resolve th.. If this card destroys an opponent's monster by battle: Inflict damage to your opponent equal to the ATK of the destroyed monster. You must have 4 or more "Laval" monsters with different names in your ..
"Gem-Knight Garnet" + 1 "Gem-Knight" monster. Must first be Fusion Summoned with the above Fusion Material Monsters. Once per turn: You can Tribute 1 face-up "Gem" monster; this card gains ATK equal t..
"Gem-Knight Sapphire" + 1 "Gem-Knight" monster. Must first be Fusion Summoned with the above Fusion Material Monsters. If this card attacks, it is change to Defense Position at the end of the Battle P..
"Gem-Knight Tourmaline" + 1 "Gem-Knight" monster. Must first be Fusion Summoned with the above Fusion Material Monsters. This card can attack twice during each Battle Phase. When this card destroys a ..
1 Tuner + 1 or more non-Tuner FIRE monsters. When this card is Synchro Summoned: Send 1 card from your hand to the Graveyard. 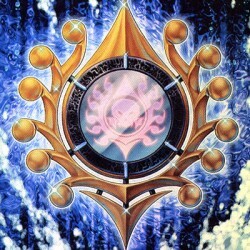 If this card would be destroyed by a card effect, you can banish 1 "Laval"..
1 LIGHT Tuner + 1 or more non-Tuner monsters. Equip Cards equipped to this card cannot be targeted by cards or effects. Once per turn: You can send 1 Equip Card equipped to this card to the Graveyard .. Send from your hand or your side of the field to the Graveyard, the Fusion Material Monsters that are listed om a "Gem-Knight" Fusion Monster Card , then Special Summon 1 that Fusion Monster from the ..